Marshall M. Fredericks Sculpture Museum | Presentation drawing for "Sheep (The Guests Have Arrived)"
Cast in bronze in 1955, this relief depicts a flock of seven foreshortened sheep staring straight ahead at the viewer. Two smaller sheep, possibly lambs, are included in the bottom right hand corner. Fredericks incorporated a great deal of detail in each of the sheep, especially in their fluffy wool coats. In the English language the phrase “black sheep” is an expression used to describe an unusual or disgraceful member of a group, especially within one’s family. In the presentation drawing for Sheep (The Guests Have Arrived), Fredericks includes one black sheep among the herd of white sheep. However, in its final form, Fredericks chose not to incorporate any wayward black sheep in the relief. Instead he opted to apply a uniform green patina to its surface. Fredericks used a similar sheep design when creating the gold anodized aluminum relief for the Central United Methodist Church in Waterford, Michigan. Christ the Good Shepherd features five sheep comparable to those found in Sheep (The Guests Have Arrived). Completed ten years after Sheep (The Guests Have Arrived), Fredericks indisputably drew inspiration for the church project from this earlier work. 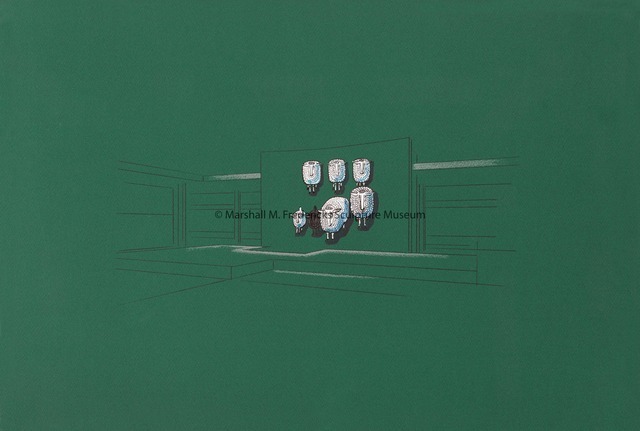 Fredericks, Marshall M., 1908-1998 , “Presentation drawing for "Sheep (The Guests Have Arrived)",” Marshall M. Fredericks Sculpture Museum, accessed April 21, 2019, http://omeka.svsu.edu/items/show/6260.